LEADING IN: Times could not be better if you were a high school football fan in Flagstaff in 1983. The Eagles and Panthers were both undefeated, sporting identical 8-0 records, and tonight’s game in the Dome had the city excited and the rest of the state watching. The Eagles were two-time defending state champions and were ranked #2 in Class AA. Their offensive strength was running the ball with four very capable backs, led by senior Tim Gill, who came into the game with 625 yards on 103 carries. Vinny Zanzucchi had completed 56% of his passes to this point for 1,029 yards and 14 touchdowns to a receiving corps that included his nephew, Brian Zanzucchi. Their defense was suffocating, allowing only 53 points in eight games, less than seven points a game. For as dominating as the Eagles were on paper, the Panthers were even more so. They were ranked #1 and for good reason. Offensively, their power came from their passing attack, led by Audie McKee, passing at a 51% completion rate for 1,641 yards and 18 TDs. It was perhaps the most potent passing attack the Panthers had ever mustered, and part of its emergence has to do with the blossoming of Phillip Miller as a true deep threat. And if you thought the Eagles’ defense was overwhelming, the Panthers gave up half of what the Eagles had, just a measly 23 points all year. The Panthers had won the last five games by shutout and hadn’t given up a point since their September 16th game against Tuba City. Coconino Head Coach Mike Olson (affectionately known to all Panthers as Oly) may have been in his first year in charge, but he was hardly a stranger to Panther football, having worked in the system since the mid-70’s under Bill Epperson’s tutelage. This was the third year for Flag High’s Rick Smith, and already he had put together an impressive resume, including two division titles, two state championships, and a 7-1 playoff record. The stakes could not have been higher. The winner of tonight’s game would go into the postseason as the #1 seed and host next week’s first round game in the Dome, the loser would be on the road despite a record with only one loss. Flagstaff was buzzing with excitement, and everyone was confident another state championship trophy would come to town, potentially the sixth since 1968. THE GAME: Approximately 14,000 fans filled the Dome to watch the Battle of the Unbeatens, a game that lived up to every bit of hype. Olson set the tone for the game on the very first play; McKee dropped back and launched a 54-yard bomb to Miller; Miller snagged the passed and fumbled when Flag High cornerback Vince Archuleta stuck him a split second later. Miller jumped on his own fumble, and though the Panther side of the Dome exhaled in relief, it was established that this game was going to be about big plays by both teams. The drive ended with McKee finding Levi Broyles in the end zone from four yards out. The Eagles were forced to punt on their first possession, and when the Panthers got the ball, it was the McKee-to-Miller combination again, this time for a 26-yard touchdown. Allen Meacham hit both extra points, and Coconino had a 14-0 lead at the end of the first quarter. Most of the second quarter was about Flag High evening the score. Gill was steadily gaining yardage, and a Mike Gonzalez reverse brought the Eagles to the Coconino 30. A Zanzucchi-to-Zanzucchi pass brought them to the 12, and Gill did the rest on an end around. Faren Mandel’s PAT cut the Panthers’ lead in half. When they got the ball back, Vinny Zanzucchi showed off his own quarterbacking prowess, completing five of eight passes on an all-passing drive, capping it off with a 15-yard scoring strike to Gary Gonzalez. Mandel missed the kick, but with a minute left until halftime and for as explosive as the Panthers had been on offense, the Eagles were only down 14-13. A minute was all McKee needed as he orchestrated another superb drive, throwing six passes, the last a 72-yard catch-and-run to Miller, and with Meacham’s PAT and five seconds left in the half, Coconino had emphatically regained momentum with a 21-13 lead. Vinny brought the Eagles back again in the third quarter, hitting Mike Gonzalez for a five-yard touchdown. Because the Eagles were down by two, however, Coach Smith opted to go for a two-point conversion and failed when Zanzucchi’s pass was batted down by the Panthers. Up 21-19 heading into the fourth quarter, the Panthers put together another scoring drive, led again by McKee. Three quick passes brought them to the Flag High 3, after which McKee found Curt Skousen for a two-yard score. The extra point would have put them up by nine, meaning the Eagles would have needed two scoring drives to win, but Meachem’s attempt was off, and the Panthers were up 27-19 with the Eagles still within reach. Vinny pushed the Eagles down the field again, passing on nine of the drive’s eleven plays, nailing Brian with a nine-yard bullet to narrow the score to 27-25. Attempting another two-pointer, Zanzucchi’s pass went incomplete, but Coconino was called for pass interference. With another chance for a conversion to tie, the Eagles tried a run this time, with Gill being stopped short. The Panthers were on the move again for another score to put the game on ice, but Robert Chilton intercepted a McKee pass on the Flag High 5, giving the Eagles the ball with one last chance and 1:29 on the clock. Their hopes, however, were dashed as Panther DB Todd Flick grabbed a Zanzucchi pass on the Eagles’ 13 to end the game. A rarity in the series, the game turned into a passing duel between McKee and Zanzucchi. The Eagle quarterback finished with 17 completions from 29 attempts for 242 yards and three touchdowns. In and of itself, that would constitute a mammoth game, but it was dwarfed by McKee’s own numbers: 38 passes, 21 completions, a school record 354 yards , and four touchdowns. Miller’s metamorphosis from butterfingered wideout to dangerous playmaker was complete as he had his biggest game on Flagstaff’s biggest stage, catching ten passes for a whopping 230 yards and two scores. AT THE END OF THE DAY: Coconino won this titanic clash and hosted the 3-5-1 Marana Tigers the next week. Though the heavy underdog, Marana gave the undefeated Panthers fits all night, playing lights-out defense that held a Coconino team that had run up over 400 yards in offense against the #2 Eagles to just 85. Marana, on the other hand, threw only four passes all night, completing none, but on a night where their veer offense racked up 271, they didn’t have to throw much. McKee was credited with 103 yards passing, virtually all of it to Miller, but between a mediocre running game that netted just two yards and losing yardage on three sacks, the Panthers’ total was less. Penalties also killed Coconino’s chances, as ten flags for 107 yards destroyed any momentum they may have gained throughout the game. A McKee-to-Miller touchdown combo in the second quarter was all they could muster, as the score remained 7-7 until just four minutes remained; Marana’s Tim Baldwin nailed a 23-yard field goal to put Marana up, 10-7. The Panthers scrambled on their final drive to set up a game-tying 37-yard attempt by Meacham, but the snap sailed over McKee’s head. While the Panthers had their hands full, the Eagles were at Lake Havasu City, manhandling the Knights, 23-2. The next week saw another Flag High victory, defeating Peoria 21-6. 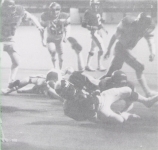 In the championship game against Flowing Wells, Smith and assistant Craig Holland made halftime adjustments that broke open a close 10-7 game, and Gill’s 55-yard touchdown run was the manifestation of those adjustments. The Eagles won, 24-7, and Smith had earned for Flag High their unprecedented third straight state championship. The only blemish on their now 11-1 record came at the hands of the Panthers.